A gorilla at Paignton Zoo in Devon has become too hot to handle. He’s started juggling with jacket potatoes. The Western lowland gorillas are often thrown hot jacket potatoes as warming treats on cold days. But over the winter, keepers noticed 13-year-old Kiondo start to throw his up into the air and catch them again. In truth, the ability is not so surprising. The genes of a gorilla are 98 per cent identical to those of humans. Gorillas also have hands and eyes that are very like ours. Studies have been done into the way the cognitive skills of human and gorilla infants develop. Gorillas in zoos have been seen walking upright on two legs and apparently playing with some enjoyment. Kiondo seems to have taken it to the next level and found himself a rather impressive hobby. Western lowland gorilla Kiondo weighs in at 186 kilos. He came to Paignton Zoo from Stuttgart Zoo in 2006; he was born on 11th October 2002. 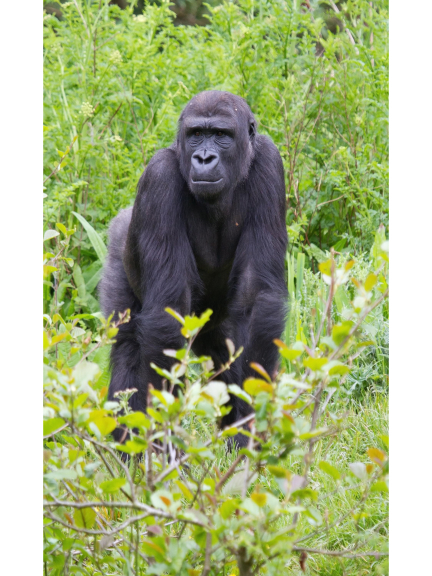 The charity’s bachelor group of Western lowland gorillas – a Critically Endangered species - plays a vital role in international gorilla conservation, providing somewhere for young males to grow up in a social environment. Some may move on to be the dominant males in bachelor or family groups in other collections as part of the European breeding programme. Paignton Zoo Environmental Park is a registered charity. For more information, go to www.paigntonzoo.org.uk or ring 01803 697500.